All 32 foundations for the German Trianel Offshore Wind Farm Borkum II have been installed in the North Sea. This clears the way for the next construction phase. All 32 monopiles and transition pieces for the German offshore wind farm have been installed on the construction site 45 kilometers off the island of Borkum. The laying of the inner-array cables and the connection of the foundation structures to the transformer station is still in progress. If the weather plays along, this work will continue throughout the winter, before the next major construction phase starts in spring. Then 32 Senvion 6.2M152 Power Upgrade wind turbines will be installed. 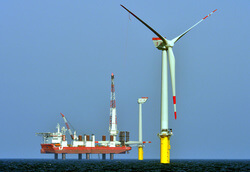 "We are right on schedule with the construction of the offshore wind farm. We have compensated well for the sometimes difficult weather conditions during the first construction phase," says Irina Lucke, Technical Managing Director of Trianel Windkraftwerk Borkum II GmbH & Co. KG. Completion of the 200 MW wind farm is scheduled for autumn 2019. EWE AG has a 37.5 per cent stake in the municipal offshore project and a 24.51 per cent stake in a joint venture between the city of Zurich's power station. The Trianel municipal utility cooperation together with 17 municipal utilities from Germany holds a share of 37.99 per cent. The total investment for the TWB II offshore wind farm is around 800 million euros.